ISROM Impex SRL is a privately owned company founded in 1992. ISROM performs a complex process with three main directions of activity: Manufacturing & Automation, Industrial Services and Sales & Distribution Network of industrial components. MANUFACTURING & AUTOMATION. ISROM is a manufacturer & automation Company which is making the designing and the producing process of mechatronic equipments, working stations, flexible manufacturing cells and flexible manufacturing lines. - machining process on our last generation brand new CNC Machining Centres. - industrial services in the mechanical, pneumatic, hydraulic and electric fields. SALES & DISTRIBUTION. 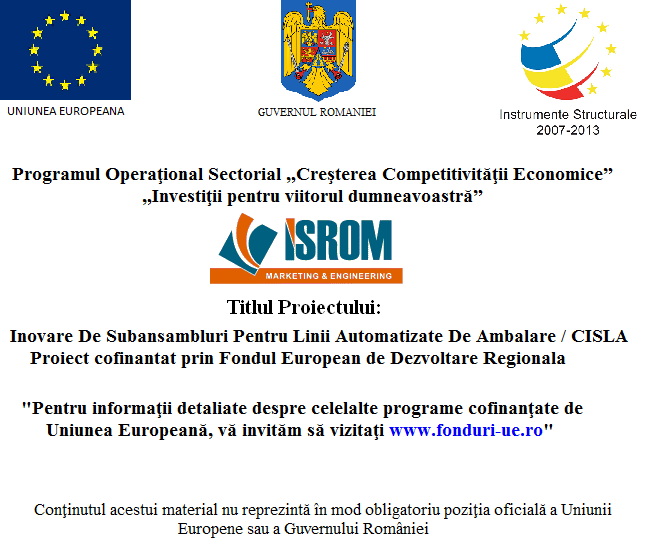 ISROM is an Industrial Authorised Importer and Distribution Network in Romania of several manufacturers, most of them being world wide leaders in the industrial field. Copyright © 2013 www.isrom.ro. All rights reserved.